Taking your wedding photos is just the beginning. Showing and sharing them in style is where the real fun starts! Our beautiful fine art wedding albums that we offer in Dallas and Fort Worth are a natural extension of IGOR Photography's storytelling style. A single photograph may be amazing, but a series of photos that are masterfully crafted into a narrative can have an increased impact in allowing couples to relive their wedding journey. When we photograph a wedding, we also keep the wedding album design in mind, constantly identifying ways to turn great moments into beautiful spreads and storytelling. The wedding album is your first family heirloom, it's romantic, ecstatic, fun, serene, every feeling of this long awaited occasion is bound in this stunning work of art. Your wedding day is your first day of a beautiful lifelong commitment. To commemorate it, you will want something worthy of that honor that honestly and exquisitely reflects you. Your custom designed wedding album means as much to us as it does for you. It's not just that it makes us feel great to make it and make you look good (though it does), we do what we do because we are proud to help couples preserve some of their most beautiful and important memories of their life. Our ability as craftsmen and artist are at the heart of each of our projects. Our exclusive fine art wedding albums are created and designed around you, with carefully attention to the story telling of your wedding and your style. As a couple you are unique and deserve a wedding album that is bespoke to you. We believe in working together to design your perfect custom wedding album, they are a collaboration project where both sides of the lens come together to create something fun and beautiful. Evey detail is custom designed to tell your story. Every layout is custom designed for you by our graphic designer, who envisions the ideal presentation of your images. You can be sure you're getting distinguished work that avoids templates and is specially crafted for you, your piece of wedding art. We have selected the best fine art albums that are available for the life-long sharing of your wedding photos. To compliment the artistry of the photography that we provide, IGOR Photography carries only the highest quality wedding albums in the world. You deserve the best! After several years of testing and trying out most fine art wedding albums and books in the market, we have selected 3 manufactures at 3 different price levels that excel above all others in quality, style and value in their respective tier. Our most exclusive album collection from one of the most prestigious album makers in the world, Graphistudio from Italy. 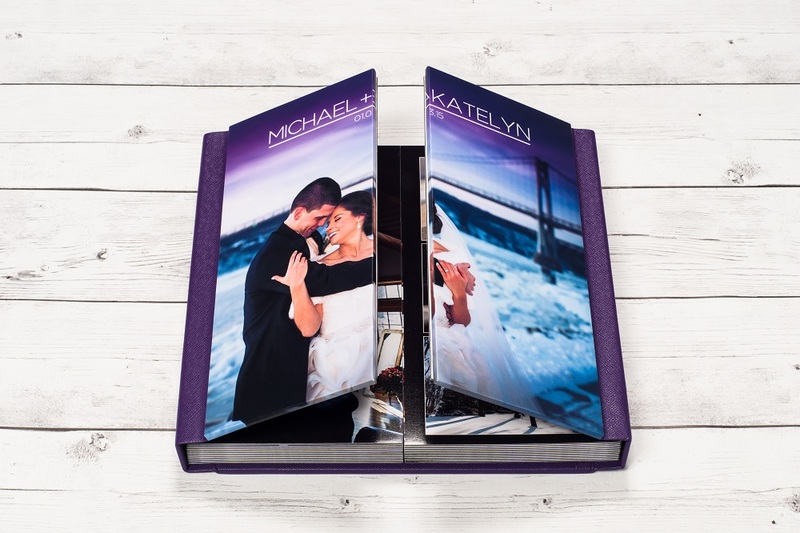 We are very proud to work with Graphistudio, they hand make one of a kind albums that are only available from approved and selected professional photographers. Every album is imported and handmade in Italy from the finest available materials, using special covers, inks and hand stitching binding techniques. The craftsmanship, the quality materials and the style are stunning. This is the "Ferrari of wedding albums". The Italian album collection is made to last as a precious family heirloom from one generation to the next. The quality is superb, you won't experience any curling of the pages, no fading of colors, no stains from finger prints or humidity or album spines that loosen up over time. This is our first and only choice for all our discerning clients and well worth the investment. Let us show you our many sample albums and the plenty of options that are available, you will love them! Click here to view different styles and covers! A high quality flush mounted album that's hand made in the USA with the highest quality materials. The Paris album has a unique French-door style cover, and pages that turn out from the center to deliver a original and beautiful album experience. Available in 5 sizes (8x8, 10x10, 12x12, 15x15, 18x18) and 24 cover colors including the B&W Collection” of 6 different textures and designs. The thick lay-flat pages are printed on Professional Kodak Photo paper, and are gloss coated for added protection and visual impact. A optional album box is available that will feature the same cover material used on your album! The top of the box will be covered in the same color as your album. Inside, your album will snuggle in a soft black luxurious velvet fabric. Replica parent albums are available in 6×6 & 8×8 size. The Paris album is a cutting edge album for the client that must have “unique”. Ask us to show you our Paris sample album! Available in 24 different colors, including 6 choices of black and white textures. Cover and Spine Leather Colors for the Paris Album. The B & W Cover and Spine collection for the Paris Album. This is our standard wedding album that is included in our wedding collections. It's made in Italy and it's available in 40 different leather cover colors, with the choice of either a solid leather cover or with a photographic cover. This album has very high quality printing, lay-flat pages, genuine photographic print pages and seamless panoramic construction with thick durable pages in glossy or mat finish. This stunning album is available with 20-60 pages and can be customized with different colors between the cover, spine and optional album box. The Modern Wedding Album selection represents modern design paired with an amazing Italian quality and high value. You can order the album with a very sleek custom box with or without a plexiglass cover with magnets. Ask us to show you a Modern Wedding Album sample! Also available with a plexiglass cover on the box with magnets. These are the available colors for the cover, spine, ribbon and box. You can combine any of these colors on The Modern Wedding Album. Why should I get a custom album instead of just having my images online, on DVD or on my computer? You can't substitute the joy and timeless feeling of viewing your photos in a tangible way where you get to touch textured pages, luxurious materials, experience the smell of thick quality paper, and when you get to turn the pages with your loved ones around a fire place. If you only keep them in your computer, online or on a DVD with the intention of viewing them or printing them "one day", my experience is that unfortunately you won't, in most cases they will be left to die in the hard drive. Because if you keep your precious images on digital media you will ultimately loose them, sorry, but it's just a matter of time. Digital media may last you 10 or maybe 50 years if you are lucky, but it wont stand the passage of time as professional prints and albums do. Digital media gets corrupted, it malfunctions, hard drives will fail and technology becomes absolute (remember the floppy disc?). Will the computers of 2025 even have DVD drives or USB ports? I have received some really sad calls from brides that lost their wedding photos that they kept on the computer, it breaks my heart and I don't want that to happen any more to any of my clients! Invest in a quality custom wedding album! Don't just do it for you. Do it for your children. Do it for your grandchildren. Because when they search around in your attic 50 years from know, they will have no idea what do with a USB flash drive anymore than they would with a 8-track tape. How much does the custom albums/books cost? Pricing ranges between $500 and $2600, depending on a wide range of materials, covers, size, and unique style options. Please contact us for more detailed information and prices, or to see our amazing fine art album samples in person at our studio. How many photos can we have in our custom album or book? Depending on style, size and number of spreads, I do have a recommended maximum number of images for each album. I usually recommend to have no more than 1 to 6 images per spread. Keeping the album layout simple and clean, only featuring your favorite photographs, that tell the story of your wedding day in a balanced and timeless way is the best way to go. Less is truly more when it comes to album design. When will we get the album? Album design is something that you don’t want to rush. It usually takes me one or two days to design a high end album. Before I start the design I will ask you if you want me to choose the images or if you want to choose some of the images. After I design the album I will order the handmade album and depending of the album collection, style and options it will take anywhere from a few weeks to two months. I will let you know when you can expect to receive it. Can I order an Wedding Guestbook with my engagement photos? Yes, I offer a beautiful contemporary guestbook that showcases your photos where guests also can sign their well-wishes. This hardcover book is a perfect replacement for the old-school tiny lined-page guestbook that you’ll probably never look at again. You can choose between paper hardcover, leather, or linen cover in different colors and with 20 lay-flat pages. $350-800 depending on type. Can I order parent albums and/or gift books from my wedding album? Absolutely, what better wedding gift to your parents, family and friends than a smaller copy of your custom wedding album? The parent album is always a big hit that is guaranteed to bring a lot of joy and appreciation. Parent albums are close copies of the main album, they are usually smaller and they have often simpler cover and materials, but they can also be made as luxurious as you wish. Gift books are much smaller pocket book size copies whose purpose is to be ordered in larger quantities (more than 4) and to be given away as inexpensive gifts. Ask us for prices and for more information about our parent albums and gift books! Schedule a viewing session at our Fort Worth studio to view our custom wedding albums and books. Call 682-233-5367 or message us today!